Vind hier de tours die jou aanspreken in Noord-Vietnam, met onze speciaal geselecteerde reizen! Dromen is eigenlijk al de eerste fase van plannen, dus waar wacht je nog op? Wie door de bomen het bos niet meer kan zien kan altijd contact met ons opnemen! Ons team zit klaar om al uw vragen te beantwoorden. Bekijk al onze reizen in Noord-Vietnam in de onderstaande lijst! 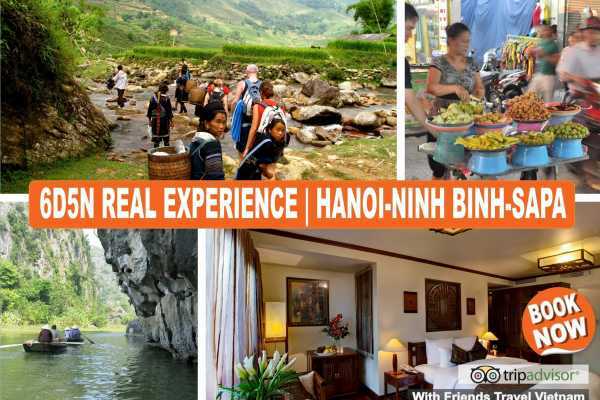 6 days starts from $ 349 | $ 58 per day all included + transfers + hotel + food tours + sapa trekking + homestay + meals Designed with great variety, these trips are geared towards travellers searching for a healthy mix of active exploration, uncommon landscapes and local cultures in the North of Vietnam. Introduction From the intensity of Hanoian streets to spectacular, cultural and historical delights. 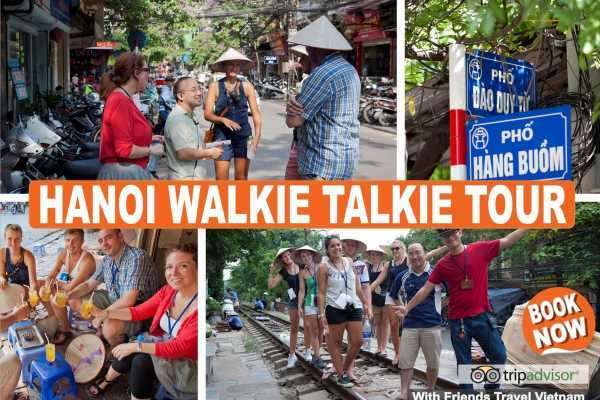 Join our afternoon Hanoi Walkie Talkie Food Tour we don't just take you around Ha Noi's hottest spots - we delve deeper into its historical past, revealing the hidden charms of Hanoi. Meet Hmong people and other minority villagers in Sapa on a hilltribe excursion and row into the photographic possibilities of beautiful breathtaking Ninh Binh Hoa Lu Tam Coc in an Sampan boat on the Dong River together with the services of our guides and your accommodation and transport is all taken care of. This trip offers great value as it introduces the region’s main sights, real homestay, trekking & biking, providing plenty of flexibility so you can experience an adventure you'll never forget With this trip, we have built our reputation! Brief Itinerary Day 1: Hanoi Pick up from the airport ( Just inform us your flight detail for pick up service). Welcome to Hanoi. (Optional visiting Water Puppet Performance | VIP massage treatment).Stay overnight at 3* Hotel inside Old Quater. Day 2: Hanoi - Ninh Binh Hoa Lu Tam Coc - Hanoi (breakfast, lunch included) Pick up at hotel around 7:30AM. Explore the beautiful breathtaking Ninh Binh Hoa Lu Tam Coc in an Sampan boat on the Dong River. After the trip drop off at the hotel. Day 3: Hanoi - Sapa (breakfast, dinner included) Join our Hanoi Walkie Talkie Food Tour, Overnight train to Lao Cai - Sapa (Included guide drop off at train station ) Day 4: Sapa - Ta Van village (breakfast, lunch included) Guide pick up at the Lao Cai train station. Meet Hmong people and other minority villagers in Sapa on a hilltribe excursion overnight in a real homestay. Day 5: Ta Van Village - Sapa - Hanoi (breakfast, lunch & dinner included) Continue our trek to visit the Red Dao people in Giang Ta Chai village, return to Hanoi by overnight train (Drop off at the train station). Day 6: Hanoi - (breakfast included) Arrange Taxi by your self to our office. Enjoy your breakfast at our office. Transfer to airport. End trip (Optional to book other packages or stay longer in Hanoi) Pricing person in $USD Tour Class Single Sup From 02 pax 3* $ 499/p $ 349/p Accommodations Class Hanoi Room Additional upgrade TripAdvisor 3* Golden Lotus Hotel Standard Upgrade on request Reviews CHECK OUR LATEST PROMOTIONS & OFFERS: Last Minute Deals | Happy Birthday Discounts | Promotions Friends Travel Vietnam offer discounts for groups of 4 or more, we encourage groups to book with us by offering discounts for group bookings. For detailed information for bigger groups, prices and tickets, please contact us! Day tour Halong Bay from $ 49 | all included + lunch + kayaking + visit cave + transfer Our hand pick Premium Selection *** (Mid-Range 1 Day Cruises). If you want to have a glint of breathtaking Halong Bay our daily full day tour would be the best choice. This join in tour offers you the overview of Halong Bay with at least 3,5+ hours cruising on Halong Bay. Discover Halong Bay aboard our Day Cruise, a wooden Asian junk that combines classic beauty with modern comfort. With a hospitable crew and experienced tour guide will show you to explore tranquil scenery in the safest conditions. You will have a chance to know about the floating village, discover their lives and visit a beautiful cave on Halong Bay. It is also available on this tour, visiting Thien Cung cave & lunch. The tour guides are friendly and knowledgeable and this tour is friendly and safe for families with children and we guarantee you 100% satisfaction. We depart daily from Hanoi or Halong Bay, Tuan Chau Harbor. CHECK OUR LATEST PROMOTIONS & OFFERS: Last Minute Deals | Happy Birthday Discounts | Promotions Friends Travel Vietnam offer discounts for groups of 4 or more, we encourage groups to book with us by offering discounts for group bookings. For detailed information for bigger groups, prices and tickets, please contact us! 3,5 Hour tour from $ 35 | all included + lunch/dinner You walk, we talk... but with this walking tour, you'll deﬁnitely have some questions for us! We don't just take you around Ha Noi's hottest spots - we delve deeper into its historical past, revealing the hidden secrets and giving you the 'Insiders Guide' to life in our awe-inspiring city. It's a feast for every sense - the sights, sounds & smells - and not forgetting tasty treats we have in store for you along the way. We'd love to tell you more, but as this is Hanoi's only unscripted and interactive tour...you're just going to have to join us! CHECK OUR LATEST PROMOTIONS & OFFERS: Last Minute Deals | Happy Birthday Discounts | Promotions Friends Travel Vietnam offer discounts for groups of 4 or more, we encourage groups to book with us by offering discounts for group bookings. For detailed information for bigger groups, prices and tickets, please contact us! 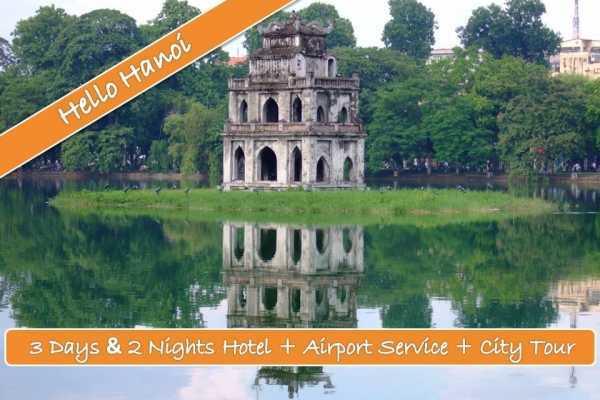 3 days & 2 nights $ 98 | $ 33 per day p.p | all included + transfers Start your trip in Hanoi Vietnam in the right way! 2 Nights Hotel 3 star + Hanoi Walkie Talkie Tour + Airport Pick Up Put together your first impressions of this fun, chaotic, bustling and one of its kind city and start off in a relax way by letting us arrange transportation from the airport without any hassle from taxi drivers. We drive you to your cozy boutique hotel where you will stay 2 nights, all setup for you, to get used to the temperature, culture and time difference. Your hotel is located in the Old Quarter, in our opinion the nicest neighborhood. Discover the insides of Hanoi by walking tour with our tour. You'll deﬁnitely have some questions for us! We don't just take you around Ha Noi's hottest spots - we delve deeper into its historical past, revealing the hidden secrets and giving you the 'Insiders Guide' to life in our awe-inspiring city. Your culinary discoveries of Vietnamese cuisine can start from here, additionally, you have plenty of time to explore this rich cultural city of Hanoi. Welcome & Hello Hanoi! CHECK OUR LATEST PROMOTIONS & OFFERS: Last Minute Deals | Happy Birthday Discounts | Promotions Friends Travel Vietnam offer discounts for groups of 4 or more, we encourage groups to book with us by offering discounts for group bookings. For detailed information for bigger groups, prices and tickets, please contact us! 3 days starts from $ 369 All incl. Transfers + Fees + Guide + Meals + Boat trip + Bamboo rafting + Cycling + Homestay The Adventurous North!! Get ready for the Adventure Tours in the best preserved part of Vietnam: The Adventurous North! Join in on bamboo rafting, climb mountains, ride along breathtaking mountain passen, take part in exciting trekkings, jump on a bicycle to get around, visit ancient temples, travel all the way to the Chinese border, and head to some of the biggest waterfalls nationwide. Make your choice, book your favourite tours with us and discover the best and most adventurous part of Vietnam, the north! Friends Travel Vietnam is at your service, and we'll do everything to ensure you'll have a good time. 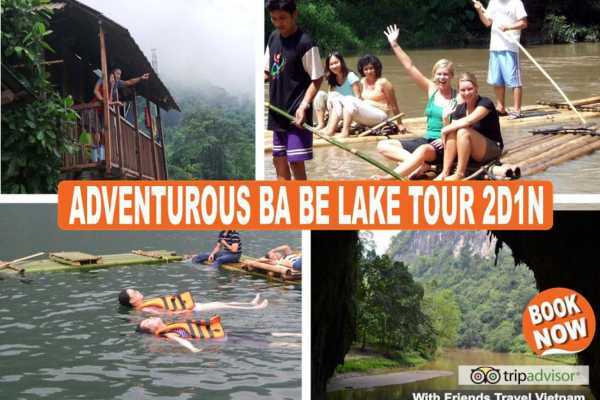 Are you ready for the "The Adventurous Ba Be and Ban Gioc Waterfalls Tour"! Introduction Ba Be Lake, situated within Ba Ba National Park, is a protected freshwater lake surrounded by evergreen forests in the Northern part of Vietnam. It is known as one of the best preserved areas nationwide, and that’s only one of the reasons why Ba Be Lake should be on your agenda. Our job to show you around in two days! We will be crossing the lake by boat, rafting down the river, visiting (bat)caves and temples and your free to go for a swim if you’d like. Furthermore we will be doing a short hike, cycle around the lake and it will be possible to visit a traditional Tay musical performance (tickets musical excluded). Near the Chinese border in the Cao Bang provence, with stunning caves and the impressive Ban Gioc Waterfalls. Water rages down many meters and will make sure you get the pictures you want. Visit all the highlights in North-Vietnam, and all this in just three days! With this trip, we have built our reputation! CHECK OUR LATEST PROMOTIONS & OFFERS: Last Minute Deals | Happy Birthday Discounts | Promotions Friends Travel Vietnam offer discounts for groups of 4 or more, we encourage groups to book with us by offering discounts for group bookings. For detailed information for bigger groups, prices and tickets, please contact us! Brief Itinerary Day 1: Hanoi - Ba Be Lake (L-D) After the pick-up in Hanoi we’ll be heading to Duom Temple, before arriving in Ba Be National Park. Crossing the beautiful blue colored Ba Be Lake will be our first activity, after we grabbed lunch. The boat will drop us off at the famous Puong Cave, also known as batcave, where these flying creatures will surprise you with their presence. The rest of the afternoon will be filled with visiting An Ma Temple, bamboo rafting and there will be time for a swim as well! Local food will be served afterwards, and it’s possible to visit a traditional Tay musical performance (tickets musical excluded). A bed is booked for you in a local Homestay. Day 2: Ba Be Lake - Ban Gioc Waterfall - Cao Bang (B-L-D) After enjoying a local lunch, we'll get to the Ban Gioc Waterfalls in the early afternoon, and the famous Ngao Cave (Tiger Cave) directly after. In the late afternoon we'll head back to our hotel to get some sleep. Day 3: Cao Bang - Lang Son - Hanoi (B-L) It's time to see the local market! Arrival will be in the late morning, and after we've set our eyes on all the local people, fruits and vegetables, Dong Dang Temple will be visited. This is very close to the Chinese border. The car back to Hanoi departs around 1PM, following the National Road 1. 5 days starts from $ 499 | $ 99 per day All incl. Transfers + Meals + Boat trip + Bamboo rafting + Home stay + Guide + fees + Permit + Water The Adventurous North!! Get ready for the Adventure Tours in the best preserved part of Vietnam: The Adventurous North! Join in on bamboo rafting, climb mountains, ride along breathtaking mountain passes, take part in exciting trekkings, visit ancient temples, caves and local markets, travel along the Chinese border, and head to some of the biggest waterfalls nationwide. Make your choice, book your favourite tours with us and discover the best and most adventurous part of Vietnam, the north! Friends Travel Vietnam is at your service, and we'll do everything to ensure you'll have a good time. 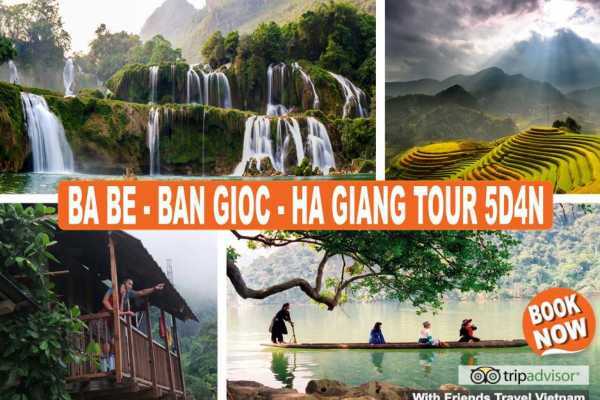 Are you ready for the "The Adventurous Ba Be - Ban Gioc - Ha Giang Tour"! Introduction Plates tectonics are responsible for the scenery of many areas on the globe, and especially in the northern part of Vietnam the results are breathtaking. Zig zag through the mountains over the small roads and see how mother nature has developed this place. Ride the famous Dong Van Pass and colorfull rivers and valleys will appear. Make sure you visited the Ma Pi Leng Pass, and the deep green Nho Que river as well. You'll regret it if you miss it. Meet local people and see how they live their lives, listen to their traditional music, visit handicraft shops and explore the Plateau Geo-park. Visit most of the nature highlights in North-Vietnam, and all this in just five days! With this trip, we have built our reputation! CHECK OUR LATEST PROMOTIONS & OFFERS: Last Minute Deals | Happy Birthday Discounts | Promotions Friends Travel Vietnam offer discounts for groups of 4 or more, we encourage groups to book with us by offering discounts for group bookings. For detailed information for bigger groups, prices and tickets, please contact us! Brief Itinerary Day 1: Hanoi - Ba Be Lake (L-D) After the pick-up in Hanoi we’ll be heading Ba Be National Park. Crossing the beautiful blue colored Ba Be Lake will be our first activity, after we grabbed lunch. The boat will drop us off at the famous Puong Cave, also known as batcave, where these flying creatures will surprise you with their presence. The rest of the afternoon will be filled with visiting An Ma Temple, bamboo rafting and there will be time for a swim as well! Local food will be served afterwards, and it’s possible to visit a traditional Tay musical performance (tickets musical excluded). Sleep in a local Homestay. 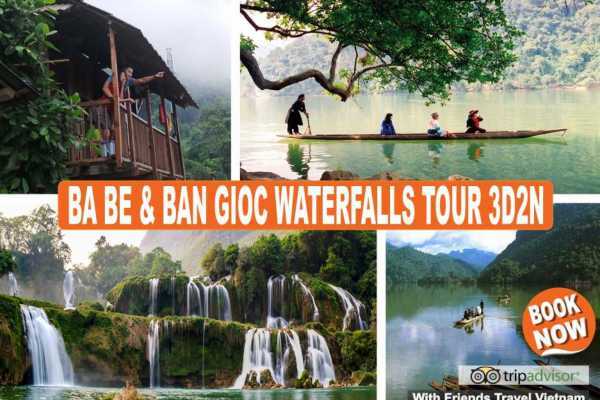 Day 2: Ba Be Lake - Ban Gioc Waterfalls - Cao Bang (B-L-D) After enjoying a local lunch, we'll visit the Ban Gioc Waterfalls in the early afternoon, and the famous Ngao Cave (Tiger Cave) directly after. In the late afternoon we'll head back to our hotel to get dinner and some sleep. Day 3: Cao Bang - Bao Lac - Meo Vac (B-L-D) It's time to see the local market! Arrival will be in the late morning, and after we've set our eyes on all the local peoples fruits and vegetables, the village of the Flower Lo Lo people will be visited. Day 4: Meo Vac - Dong van - Quan Ba (B-L-D) The first stop will be at the Meo Vac local market. The Karst Plateau Geo-parkwith deep green Nho Que River and the most dangerous mountain-pass Ma Pi Leng will be explored afterwards. After lunch we will stop at the Vuong’s Villa to get to know more about the life of the H’Mong people. Visiting the sewing handicraft village of H’Mong people will be our last activity of the day. Day 5: Quan Ba - Ha Giang - Hanoi (B-L) We'll be having breakfast, and head back to Hanoi. There will be time to visit the amazing Fairy Bosom - the symbol of Quan Ba tourism - in the village of Quan Ba on the way. 3 days starts from $ 212,50 per day All incl. Transfers + Fees + Guide + Meals + Boat trip + Bamboo rafting + Cycling + Homestay The Adventurous North!! Get ready for the Adventure Tours in the best preserved part of Vietnam: The Adventurous North! Join in on bamboo rafting, climb mountains, ride along breathtaking mountain passes, take part in exciting trekkings, jump on a bicycle to get around, visit ancient temples, travel all the way to the Chinese border, and head to some of the biggest waterfalls nationwide. Make your choice, book your favourite tours with us and discover the best and most adventurous part of Vietnam, the north! Friends Travel Vietnam is at your service, and we'll do everything to ensure you'll have a good time. 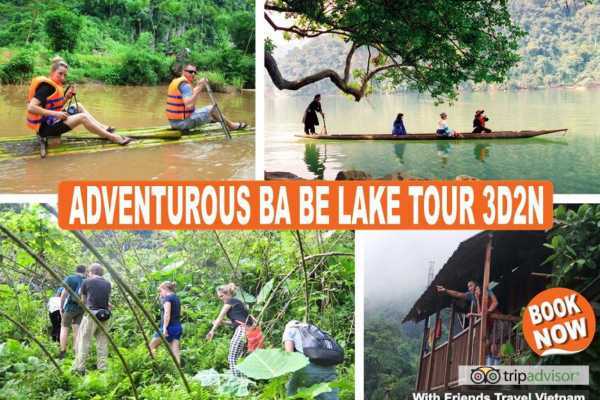 Are you ready for the "The Adventurous Ba Be Lake Tour 3D2N"! Introduction Ba Be Lake, situated within Ba Ba National Park, is a protected freshwater lake surrounded by evergreen forests in the Northern part of Vietnam. It is known as one of the best preserved areas nationwide, and that’s only one of the reasons why Ba Be Lake should be on your agenda. Our job to show you around in three days! We will be crossing the lake by boat, rafting down the river, visiting (bat)caves and temples and your free to go for a swim if you’d like. Furthermore we will be doing hikes, cycle around the lake and it will be possible to visit a traditional Tay musical performance (tickets musical excluded). All this in just three days! With this trip, we have built our reputation! CHECK OUR LATEST PROMOTIONS & OFFERS: Last Minute Deals | Happy Birthday Discounts | Promotions Friends Travel Vietnam offer discounts for groups of 4 or more, we encourage groups to book with us by offering discounts for group bookings. For detailed information for bigger groups, prices and tickets, please contact us! Brief Itinerary Day 1: Hanoi - Ba Be Lake (L-D) After the pick-up in Hanoi we’ll be heading to Ba Be National Park, and visit the famous Duom Temple on the wat. Crossing the beautiful blue colored Ba Be Lake will be our second activity, after we grabbed lunch. Then, the boat will drop us off at the famous Puong Cave, also known as batcave, where these flying creatures will surprise you with their presence. The rest of the afternoon will be filled with visiting 'The Three Lakes', the An Ma Temple, bamboo rafting and there will be time for a swim as well! Local food will be served afterwards, and it’s possible to visit a traditional Tay musical performance (tickets musical excluded). A bed is booked for you in a local Homestay. Day 2: Ba Be National Park - Pac Ngoi (B-L-D) The activities of the second day will depend on the choice of the whole group. Option 1 (main option): 20 km medium trekking. Option 2: 8 km easy trekking. Option 3: 20 km hard trekking + boat trip. Check the Itinerary for the details! Day 3: Ba Be Lake - Hua Ma Cave - Hanoi (B-L) We’re getting the bikes out for a cycling tour to the biggest cave in this area, Hua Ma Cave. Lunch will follow, and the bus back to Hanoi will depart in the early afternoon. Like we always do, you will be dropped of at your hotel. 2 days starts from $ 142,50 per day All incl. Transfers + Fees + Guide + Meals + Boat trip + Bamboo rafting + Cycling + Homestay The Adventurous North!! Get ready for the Adventure Tours in the best preserved part of Vietnam: The Adventurous North! Join in on bamboo rafting, climb mountains, ride along breathtaking mountain passes, take part in exciting trekkings, jump on a bicycle to get around, visit ancient temples, travel all the way to the Chinese border, and head to some of the biggest waterfalls nationwide. Make your choice, book your favourite tours with us and discover the best and most adventurous part of Vietnam, the north! Friends Travel Vietnam is at your service, and we'll do everything to ensure you'll have a good time. Are you ready for the "The Adventurous Ba Be Tour"! Introduction Ba Be Lake, situated within Ba Ba National Park, is a protected freshwater lake surrounded by evergreen forests in the Northern part of Vietnam. It is known as one of the best preserved areas nationwide, and that’s only one of the reasons why Ba Be Lake should be on your agenda. Our job to show you around in two days! We will be crossing the lake by boat, rafting down the river, visiting (bat)caves and temples and your free to go for a swim if you’d like. Furthermore we will be doing a short hike, cycle around the lake and it will be possible to visit a traditional Tay musical performance (tickets musical excluded). All this in just two days! With this trip, we have built our reputation! CHECK OUR LATEST PROMOTIONS & OFFERS: Last Minute Deals | Happy Birthday Discounts | Promotions Friends Travel Vietnam offer discounts for groups of 4 or more, we encourage groups to book with us by offering discounts for group bookings. For detailed information for bigger groups, prices and tickets, please contact us! Brief Itinerary Day 1: Hanoi - Ba Be Lake (L-D) After the pick-up in Hanoi we’ll be heading to Ba Be National Park. Crossing the beautiful blue colored Ba Be Lake will be our first activity, after we grabbed lunch. The boat will drop us off at the famous Puong Cave, also known as batcave, where these flying creatures will surprise you with their presence. The rest of the afternoon will be filled with visiting An Ma Temple, bamboo rafting and there will be time for a swim as well! Local food will be served afterwards, and it’s possible to visit a traditional Tay musical performance (tickets musical excluded). A bed is booked for you in a local Homestay. Day 2: Ba Be Lake - Hua Ma Cave - Hanoi (B-L) We’re getting the bikes out for a cycling tour to the biggest cave in this area, Hua Ma Cave. Lunch will follow, and the bus back to Hanoi will depart in the early afternoon. Like we always do, you will be dropped of at your hotel. Price All incl. Private Cruise + English speaking guide + Kayaking + Meals + Fees Introduction Cruise along this unique and fascinating scenery of Halong Bay on your own cozy mini private cruise, see the karst islands up close and personal and taste traditional Vietnamese dishes during lunch and dinner. Get the chance to explore nature like you never did before by enjoying the karst mountain views on your private cruise, taking off in a kayak to explore the area, take a swim and rent a bike to ride along Cat Ba Island. Visit local fishing villages, nearby caves and narrow lagoons. Discover private beaches, learn about the environment with your personal tour guide and do it with just your private group! A beautiful area like Halong Bay has to be protected. That’s why have solar energy panels on our private boat. Furthermore, nobody likes crowded places. We’ll avoid the touristic areas by taking a non –touristic route, so the only thing you have to do is sit back and have a good time. The bay 7,000 ha big and has 139 beautiful, small and pristine sandy beaches, many of which lie between two stone mountains. Just imagine that after a long day of exploration of caves and grottoes, you will feel entirely relaxed bathing the azure-blue waters of Halong or lying on the white sandy beaches. At night, you will be lured by the magnificent and splendid scenery of the bay and it will be an unforgettable experience to do an overnight in the Bay with a gentle breeze and the slightly salty air from the forest on the stone mount. Wandering on the azure-blue beach, breathing in the ocean breeze and enjoying the tropical sunlight, along with a kayaking trip and maybe even some fishing, your trip to Lan Ha Bay will surely be a long lasting memory. We provide serveral options of every tour, so select your favourite activities and join us to visit the most breath-taking area in Vietnam: Halong Bay! Read about all our tour options on our website and don’t hestitate to send us any questions you might have, we’d be happy to help you out. Are you ready for the "The Real Halong Bay Private Cruise Experience 2D1N"! IMPORTANT | Check availability before booking: Contact us Our Cozy Mini Private Cruise Options Cruise 1 & 2 2 cabins 1 double bed + 1 single bed in each room Max 6 pax Cruise 3 3 cabins 1 triple (1 double bed + 1 single bed), 1 twin + 1 single Max 6 pax Cruise 4 2 cabins 1 double + 1 twin room Max 4 pax Our pricing Group Price for Price per pax - 1 pax 1 pax 627 $USD - 2 paxs 1 pax 352 $USD - From 3 paxs 1 pax 258 $USD CHECK OUR LATEST PROMOTIONS & OFFERS: Last Minute Deals | Happy Birthday Discounts | Promotions Friends Travel Vietnam offer discounts for groups of 4 or more, we encourage groups to book with us by offering discounts for group bookings. For detailed information for bigger groups, prices and tickets, please contact us! Brief Itinerary Day 1: Hanoi - Hai Phong - Ha Long Bay - Lan Ha Bay - Cat Ba Island (L-D) Wake up early as we will depart to Hai Phong Harbor around 6:30AM. The hydrofoil (speed boat) from Hai Phong will take us to Cat Ba Island, where you will board you private cruise around 11AM. Your beautiful cruise trip along Halong Bay will start now! Sit back and relax with friends and family. Our first stop is an authentic floating village where a fresh seafood lunch will be served. Next on the agenda is kayakking. Explore the scenic area, the narrow lagoons and visit the tunnel cave, called Hang Ca (the Bat Cave). Our cruise continues to the Bai Trai Dao Beaches. Enjoy your free time by swimming and relaxing. The stunning sunset will tell us it’s time to get some well deserved sleep. Day 2: Cat Ba Island - Hai Phong - Hanoi (B-L) Wake up to see dawn, have breakfast and proceed your trip through the stunning Halong Bay in the morning. Visit the local floating fish farm and see how locals life their life. There will be time for a last swim and then we arrive at Cat Ba aroud 11AM. We will enjoy lunch on the harbor and enjoy your free time at Cat Ba can be filled in by exploration by bike of by foot. Visit their beaches or head to the market to see local vegetables and meat, and other local products before we take the hydrofoil back to Hai Phong in the early afternoon. The bus back to Hanoi arrives around 5:30PM. 3 days & 2 nights starts from $ 248 | $ 82 per day All incl. 2 night Private Cruise + English speaking guide + Kayaking + Meals + Fees + transport Introduction Cruise along this unique and fascinating scenery of Halong Bay on your own cozy mini private cruise, see the karst islands up close and personal and taste traditional Vietnamese dishes during lunch and dinner. Get the chance to explore nature like you never did before by enjoying the karst mountain views on your private cruise, taking off in a kayak to explore the area, take a swim and rent a bike to ride along Cat Ba Island. Visit local fishing villages, nearby caves and narrow lagoons. Discover private beaches, learn about the environment with your personal tour guide and do it with just your private group! A beautiful area like Halong Bay has to be protected. That’s why have solar energy panels on our private boat. Furthermore, nobody likes crowded places. We’ll avoid the touristic areas by taking a non –touristic route, so the only thing you have to do is sit back and have a good time. The bay 7,000 ha big and has 139 beautiful, small and pristine sandy beaches, many of which lie between two stone mountains. Just imagine that after a long day of exploration of caves and grottoes, you will feel entirely relaxed bathing the azure-blue waters of Halong or lying on the white sandy beaches. At night, you will be lured by the magnificent and splendid scenery of the bay and it will be an unforgettable experience to do an overnight in the Bay with a gentle breeze and the slightly salty air from the forest on the stone mount. Wandering on the azure-blue beach, breathing in the ocean breeze and enjoying the tropical sunlight, along with a kayaking trip and maybe even some fishing, your trip to Lan Ha Bay will surely be a long lasting memory. We provide serveral options of every tour, so select your favourite activities and join us to visit the most breath-taking area in Vietnam: Halong Bay! Read about all our tour options on our website and don’t hestitate to send us any questions you might have, we’d be happy to help you out. 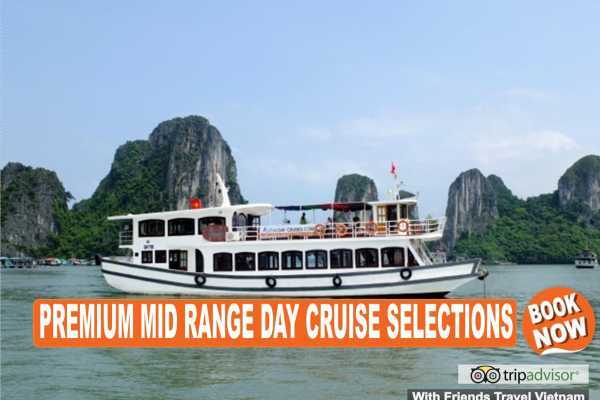 Are you ready for the "The Real Halong Bay Private Cruise Experience 3D2N | Option A! IMPORTANT | Check availability before booking: Contact us Our Cozy Mini Private Cruise Options Cruise 1 & 2 2 cabins 1 double bed + 1 single bed in each room Max 6 pax Cruise 3 3 cabins 1 triple (1 double bed + 1 single bed), 1 twin + 1 single Max 6 pax Cruise 4 2 cabins 1 double + 1 twin room Max 4 pax Our pricing Group Price for Price per pax - 1 pax 1 pax 956 $USD - 2 paxs 1 pax 535 $USD - 3 paxs 1 pax 389 $USD - 4 paxs 1 pax 317 $USD - 5 paxs 1 pax 278 $USD - 6 paxs 1 pax 248 $USD CHECK OUR LATEST PROMOTIONS & OFFERS: Last Minute Deals | Happy Birthday Discounts | Promotions Friends Travel Vietnam offer discounts for groups of 4 or more, we encourage groups to book with us by offering discounts for group bookings. For detailed information for bigger groups, prices and tickets, please contact us! Brief Itinerary Day 1: Hanoi - Hai Phong - Ha Long Bay - Lan Ha Bay - Cat Ba Island (L-D) Wake up early as we will depart to Hai Phong Harbor around 6:30AM. The hydrofoil (speed boat) from Hai Phong will take us to Cat Ba Island, where you will board you private cruise around 11AM. Your beautiful cruise trip along Halong Bay will start now! Sit back and relax with friends and family. Our first stop is an authentic floating village where a fresh seafood lunch will be served. Next on the agenda is kayakking. Explore the scenic area, the narrow lagoons and visit the tunnel cave, called Hang Ca (the Bat Cave). Our cruise continues to the Bai Trai Dao Beaches (Three Pearls Beaches). Enjoy your free time by swimming and relaxing. The stunning sunset will tell us it’s time to get some well deserved sleep. Day 2: Cat Ba Island - Viet Hai port - Cat Ba National Park - Viet Hai Village (B-L) Wake up to see dawn, have breakfast and proceed your trip with your Private Cruise towards Viet Hai Port. You'll be entering the Cat Ba National Park and head to the authentic village of Viet Hai to explore it by bicycle or by walk. Your tour guide will help you to understand the way of living of the local people. Then it'll be time to climb up and visit a famous natural cave. Once back at the boat there'll be free time for swimming, before lunch is served. The floating farm is a must-see on this trip! We'll take you there and show you the beautiful Hang Luon cave (tunnel cave) afterwards by kayak. Relax at the beach afterwards and enjoy dinner and a well deserved night of sleep in the middle of the bay on your private cruise. Day 3: Cat Ba Island - Hai Phong - Hanoi (B-L) We'll be cruising to a small but beautiful beach to relax a bit more and head back to Cat Ba Island afterwards and get off the boat. During your free time on this fascinating island there are many options. Relax at one of the beautiful beaches, explore the area by motorbike or go for some shopping. The hydrofoil (speed boat) brings you back to Hai Phong, where you will be driven back to Hanoi.